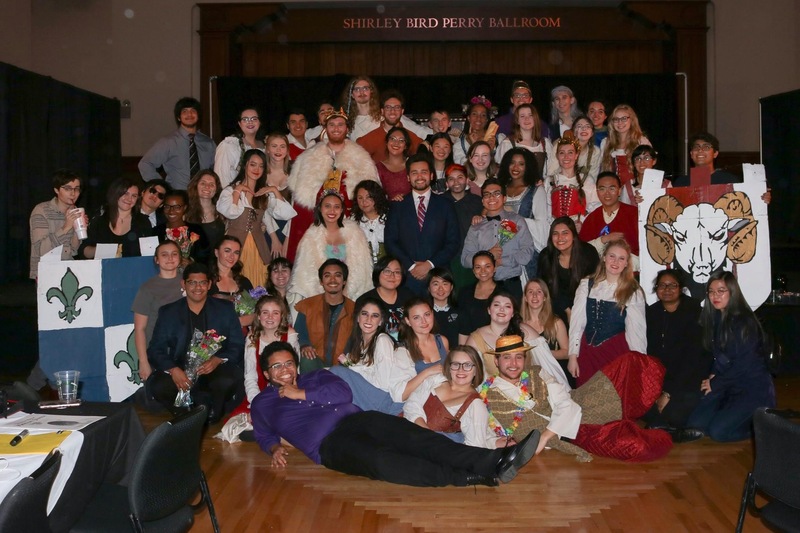 Creative Arts + Theatre is a home for showcasing student talent through theatre, dance, visual arts, open mics and Madrigal Dinner, an annual Renaissance-themed dinner theatre tradition. All aspects of our events are student-produced and include script/music writing, acting, design, choreography, directing and tech. Creative Arts + Theatre has opportunities for all students regardless of their background, experience, major, or artistic abilities. Members contribute to committee events and activities across of a host of disciplines. These include performing, writing, directing, producing, event planning, and tech. Members are afforded ample opportunities to contribute creatively, learn new skills, and take on new roles. There are mentorship and training programs in all areas throughout the year. All of our productions are original, student-created works. Past events have included improv, plays, musicals, sketch comedy, musical revues, and even a murder mystery. Now entering its 38th year, the Madrigal Dinner is E+E’s longest running event. Generations of UT students have been delighted by this annual fall tradition and come back year after year. Madrigal Dinner is a Renaissance-style dinner theatre experience. It features an original, student-produced play, a choir concert, improv performances, and a four-course meal. Please join us for a night of laughter, action, song, and bread pudding. We hope to see you there. Huzzah!